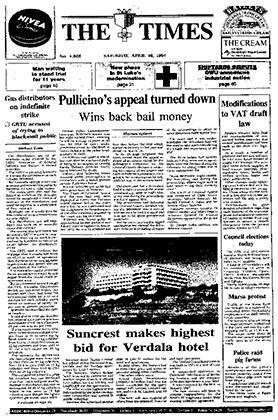 Former Police Commissioner Lawrence Pullicino’s appeal was last night turned down, meaning he will be serving 15 years in jail, less the time he spent under preventive arrest, for the death of Nardu Debono at the police headquarters in 1980. Dr Pullicino was jailed in March last year after he was found guilty of being an accomplice in causing Nardu Debono grievous bodily harm followed by death. Another stage in the modernisation programme for St Luke’s Hospital is to start next month. The project involves the evacuation of wings, the building of new wards, a revamp of water, electricity and drainage services and a general upgrading of the main complex. Suncrest Hotel (Malta) Ltd has offered to buy the Grand Hotel Verdala for Lm3 million and Lm300,000 for the Verdala apartments. The offer was the highest bid received by the Malta Development Corporation. The 160-bed hotel was built in 1971 at a cost of Lm2 million. His Grace the Archbishop is expected to leave for Rome this morning, accompanied by Dr Paul Farrugia, director of the Blood Bank. The visit is aimed at finding ways and means to establish the blood bank on a permanent basis and to develop its various aspects. His Grace remarked that the blood bank was a project very much to his heart. 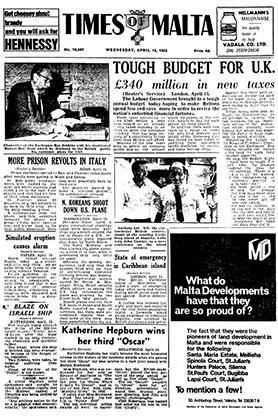 The blood bank was his idea supported by Dr Farrugia and Mgr Prof. E. Coleiro: it was aided financially by the Cathedral Chapter, which was responsible for the provision of the entire equipment. The bank was also maintained by the Sovereign Military Order of St John. 49 Field Regiment Larkhill Royal Artillery will be carrying out a subacqua expedition in St Paul’s Bay and Mellieħa Bay for underwater exploration and survey between tomorrow and May 12. The aim is to try and locate the site of St Paul’s shipwreck. The party will be led by a Maltese officer, Lieutenant H. C. Abela, and will consist of a total of 13 men.